The Largest Childrens Soft Play Hire In Essex! Are you looking for soft play packages in Canvey Island? Choose Canvey Island castles for getting professional service that is radiant for infants and children up to the age of 15. Our professionals are highly flexible with our soft play collection items. Having extensive years of experience we are one of the largest inflatable hire family specializing in all aspects of inflatable fun in Canvey Island. We provide proficient soft play hire services and use supreme quality of clean soft play equipment on a fully matted area. If you are planning children party, weddings or any other events our soft play shapes, ball pools and tunnels are an ideal choice for you. 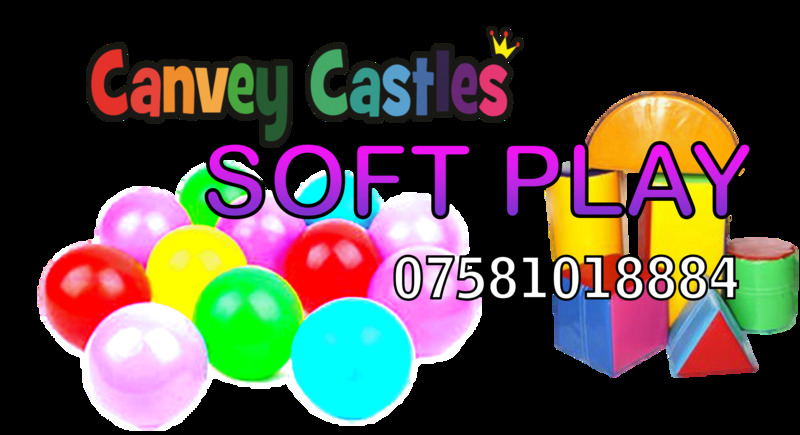 Additionally, if you want to organize a garden party and looking for soft play hire in Canvey Island consult us.Our castles are available in many sizes small, medium and large.We are best soft play hire company in essex. CALL 0758 101 8884 for a free quotatiion today! We are expertise in offering soft play hire in Canvey Island, Essex with a large range of quality bouncy castles, both plain and themed. Some of our popular theme includes- Spiderman, Princess, Disney, Minions, Toy Story, SpongeBob, Jurassic Park, Pepper Pig, Frozen and Thomas Tank Engine. For any occasion, we provide inflatable rentals that meet your demands. Give us a call and enjoy the fun of soft play castles hire in essex. Package one is our animal themed soft play package without a castle. This package includes the following items: Ball pit, large animal soft shapes, circus tent, 5 scramble bug riders, 1 trike, 2 foam dices, 2, space hopper, 2 bike tricycle, 4 fury smiley face balls, rollercoaster car, 7 animal hoppers, 2 large footballs, interanctive piano and hop scotch, tunnel, over 20 mixed colour sized shapes, stairs and slope shape, crocodile see-saw and zebra bouncer. **GREEN** Package 3 Includes: Package three is our smaller multicoloured shape soft play package without a castle. This package includes the following, 9 mixed at random sized shapes in various colours, a cow trike, ball pit, circus tent, large mega ball, 1 space hopper, dice and tunnel. **PURPLE** Package 5 Includes: Package five is our unicorn rainbow themed soft play package with our 10ftx 12ft unicorn painted art castle (with the option to add speaker and disco light into castle). This package includes the following items: 3 unicorn hoppers, 2 rainbow balls, play tunnel, pop up tent, ball pit, 15 piece shape set. Package seven is our paw patrol themed soft play package with our 12ft x 15ft Paw Patrol themedcastle included. This Package includes the following items: 2 paw patrol space hoppers, see-saw, 2 diddy cars, chase pop up tent car, 15 piece themed shape set, 2 small play balls and themed ball pit with all matting supplied as standard. Package two is our animal themed soft play package with any of our small or medium sized bouncy castle of your choice to go alongside. This package includes the following items: Ball pit, large animal soft shapes, circus tent, 5 scramble bug riders, 1 trike, 2 bike tricycles, 2 space hoppers, 2 foam dices, 4 fury smiley face balls, rollercoaster car, 7 animal hoppers, 2 large footballs, interanctive piano and hop scotch, tunnel, over 20 mixed colour sized shapes, stairs and slope shape, crocodile see-saw and zebra bouncer. **PINK** Package 4 Includes: Package four is our peppa pig themed soft play package with our 8ftx 10ft peppa pig painted art castle. This package includes the following items: Peppa pig bouncy castle, pink slide, pop up tent, play tunnel, red foam dice, pink ball pit, 4 character shapes, 5 random mixed shapes and step slope shape. **ORANGE** Package 6 Includes: Package six is our paw patrol themed soft play package with no castle included. This Package includes the following items: 2 paw patrol space hoppers, see-saw, 2 diddy cars, chase pop up tent car, 15 piece themed shape set, 2 small play balls and themed ball pit with all matting supplied as standard.